SKD 2/c Russell L. Lewis, son of Mr. and Mrs. M. H. Lewis, attended school in Edmond: husband of the former Rebecca Ashbrook. 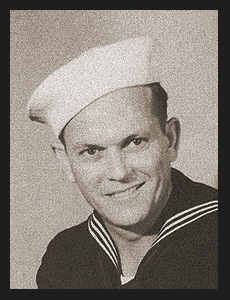 Entered Navy in April, 1943, trained in Camp Peary, Va., Providence, R.I. and Gulfport, Miss. ; served in Hawaii, New Caledonia, New Guinea, New Britain, the Philippines, and San Francisco, Cal. Awarded Am. Theatre Ribbon, Asiatic Pacific Ribbon, and Philippine Lib. Ribbon with two Battle Stars.